From delicious wontons to quick pasta dishes, here are 15 amazing lamb dishes to celebrate the Year of the Sheep. Danny Bowien's incredible wontons get a fun Scandinavian twist thanks to the yogurt, salmon roe and dill garnish. Adding brandy to the marinade gives these quick kebabs their fantastic flavor. These delicious roasted racks of lamb are brushed with soy sauce and crusted in a flavorful spice mix of Sichuan peppercorns, cumin and star anise. An anchovy-spiked tomato sauce tops these fantastic meatballs. This quick, easy stir-fry is perfect for a crowd. Greek flavors star in this healthy lamb ragù. These fast, juicy lamb chops are served with a delicious garlic-and-sherry pan sauce. Tender lamb neck stars in this hearty stew. "Lamb ribs are the most inexpensive and unsung parts of the lamb," says chef Tom Mylan. Miami chef Michael Schwartz's terrific lamb is glazed with Greek yogurt and served with a healthy, hemp seed-based pesto. Sang Yoon's beautiful salad features slices of cumin-spiced lamb. 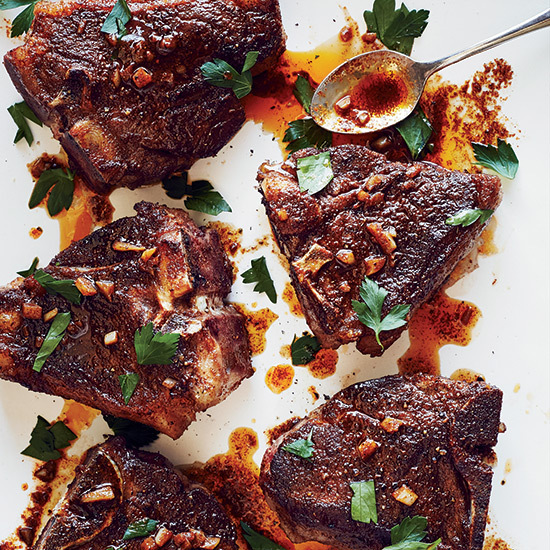 Smoky pimentón de la Vera adds fantastic heat to Nancy Silverton's grilled lamb chops. Store-bought pappardelle, ground lamb and chicken stock make quick work of Andrew Carmellini's excellent pasta dish. Anaheim and serrano chiles add bright flavor to these fast burgers. Four ingredients (plus salt and pepper) are all you need for this gorgeous centerpiece roast.